Please tell us a little about yourself, where are you from? I was born and raised in Brooklyn, New York to Puerto Rican parents. I currently live in Gaithersburg, MD. I live with my rescue, a beagle mix―more like a hound mix named Molly. Where did you get the idea for The Vicar’s Deadly Sin? A friend I worked with and I pretended we were living during Jane Austen’s time. We would email each other a story line that began as friends living in the coast of England and from there we were becoming involved in a mystery. The rest became the Vicar’s Deadly Sin. Why did you choose this genre? I love Jane Austen and Nancy Drew. So, I thought about two friends during the Regency period who fancied themselves the first female detectives. But because of society back then they have a hard time proving that they have what it takes. Was there anything unusual, any anecdote about this book, the characters, title, process, etc. you’d like to share? I have readers tell me they get angry with Margaret, one of my main heroines. I love that. Margaret is difficult, but once you get to know her you understand her plight. What is the most difficult thing about writing a book? Realizing that it takes time, effort and hard work. You can’t just give up, especially if you feel it is your calling. What was the most difficult thing about this one in particular? Well, I think research…even though I can’t call it a historical romance, I did stay true to the period and any historical people I mention in the book. Are there any tricks, habits or superstitions you have when creating a story? No, I mean I know people that do have one or more, but, I don’t. I believe in writing, writing, research and then writing some more until the book is finished. Then there is another phase of the writing which is edit, edit and then edit. What book have you read that you wish you had written? Great question and a hard one…Montana Sky by Nora Roberts. Do you have another occupation, other than writer? If so, what is it and do you like it? I am a Sr. Committee Management Specialist at the National Institutes of Health. I love my job. It took ten years to get it and now that I am there I am learning all sorts of things that goes with the position. I used to collect Barbies. Now I collect only the Hollywood editions. What do you want readers to come away with after they read The Vicar’s Deadly Sin? I want them to come away for appreciation of the work that went into it, the joy they got from ready about Margaret and Jane’s escapades and finally that they loved the book. I have several stories that range in sub-genres. For example, I have one that is a science fiction, horror, and crime thriller. All of these fall in the genre of Romance. Phone, laptop, and millions of books. I know I may not have electricity, so that is where the books come in handy. Is there one subject you would never write about? What is it? I don’t like non-fiction. I rather create worlds beyond one’s own imagination. She strived and while she was not financially success she lived life as she wanted to. I would be Margaret in the Vicar’s Deadly Sin. I am currently working in the sequel to VDS called Angel’s Lust. It has nothing to do with sexual lust. But the lust for ageless beauty. As a matter of fact, I hope to get that one out by July. Latham. He is my Mr Darcy in this book. I would spend the entire day with him: breakfast, lunch and dinner. Talk about our interests. Get to know him better. Typos. As a newbie with little to no budget you depend on book clubs, beta readers, and other author friends to read your manuscript in the hopes of catching typos and grammatical errors. But, it happens where they do tend to slip by. What has been the best compliment? The best compliment for me has been when a reader has questions about the characters and they tell me if they related to them or not. They think it is amazing and can’t figure out how I did it…create a whole world. Who is the most famous person you have ever met? I’ve been to Nora Roberts house several times for a picnic she gives each year to volunteers of the Washington Romance Writers. In pictures she uses for her books, she looks larger than life, but when you meet her she is humble and gracious. I wanted something based on one of the deadly sins, so I chose greed and needed someone to die. Someone who needed money. So I thought a vicar would be such person. Yes, especially for women…don’t let anyone keep you from your dreams. I tried to make it realistic in that I stuck with the way society treated women in 1815 England. I also mention things about the Prince Regent that were accurate as well as Napoleon’s defeat in the hands of Wellington. How did your interest in writing originate? Since a kid I would make up stories not realizing that these stories were really talking to me to be written. My favorite is Jane Austen. I love the way her stories make fun of society while bringing the reader romance. Which do you prefer: Board games/card games or television? Television. Television gets me into trouble for I tend to watch more than I should, keeping me away from writing. Thank you so much for joining me! I’m with you on the television watching. I love it! But, I am able to edit while watching, so I still try to be productive. 😀 Please tell us about your latest release…. Lady Jane Bartholomew and Miss Margaret Renard have been friends since the age of twelve. Together they share their dreams, hopes and a love for reading. However, it is their wild imagination and a penchant for solving mysteries that will test their abilities when the Vicar of Dover is found murdered. The young ladies are joined by two gentlemen, also eager to find the murderer in order to prove to the ladies that detecting is a man’s job, though the gentlemen find their beauty, wit, and pride more troublesome than solving a murder. Ms. Miguelina Perez is a writer, and jewelry artist. She earned her Bachelor of Arts degree in English from the University of the District of Columbia. As a jewelry artist one of her lariats was showcased in the San Antonio Express-News. She has won several awards including a critical Writing award for an essay on the gender roles of Mark Twain’s Huckleberry Finn and Louisa May Alcott’s Little Women. Ms. Perez is the coordinator of the Lady Jane’s Salon Silver Spring’s – A satellite of Lady Jane’s NYC, the Silver Spring reading salon is devoted to celebrating romance fiction. LJSSS is proud to host debut authors to bestsellers of romance fiction, covering the full spectrum of the diverse and ever-evolving romance genre from traditional historical and contemporary romances to novels that cross over to science fiction, futuristic, fantasy, paranormal, and GLBT to name but a few. Currently, Ms. Perez is working the sequel to the Vicar’s Deadly Sin, “Angel’s Lust” from her Seven Deadly Sins series and “A Hero of Her Own” a contemporary romance thriller, about a serial killer terrorizing New York. Ms. Perez is a member of the Romance Writers of America and two of its chapters: Washington Romance Writers and Maryland Romance Writers . 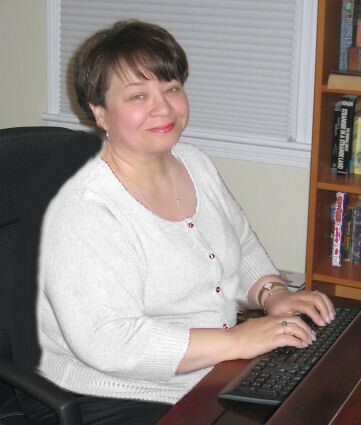 As newsletter editor for WRW, she contributes articles about writing and author interviews. Originally from Brooklyn, NY, Ms. Perez resides in Gaithersburg, Maryland and can be reached at: miguelinaperez@miguelinaperezauthor.com. You can also follow Ms. Perez via twitter at: @MPerezAuthor. I really enjoyed the interview, ladies! Love, love the cover! Nice interview! I, too, Love Jane A. and P & P is my fave of hers–I re-read it every year whether I need to or not! Good luck and I love your cover! I love the idea of two ladies solving a murder in the Regency!